Coastal Two-Tone Stripe Duvet Collection - VHC Brands | P.C. Fallon Co. Create a light and airy, blue sky day retreat with a Coastal Two-Tone Stripe Duvet Cover featuring stripes in a medium stonewashed denim blue and a lighter sky blue interspersed with a crème/white. The lovely blues will have you dreaming of blue skies and bright days. For a touch of coastal charm, 12 coconut button closures on the lower end hold in your comforter. The back of the duvet cover has the same stripes as the front. There are 4" twill tape ties on each corner to connect to a comforter. Single fabric with turned edge seam. Give your comforter a change of scene by slipping it into one of these duvet covers. Add matching shams to complete your transformation. 100% cotton. Machine wash gentle. Tumble dry low. These items are imported. 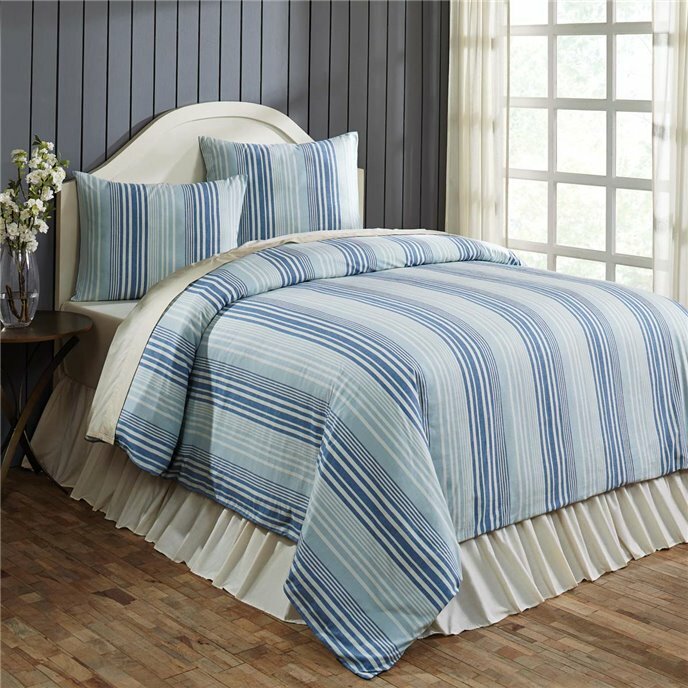 The Coastal Two-Tone Stripe Queen Duvet Cover features stripes in a medium stonewashed denim blue and a lighter sky blue interspersed with a crème/white. The lovely blues will have you dreaming of blue skies and sunny days. For a touch of coastal charm, 10 coconut button closures on the lower end hold in your comforter. The back of the duvet cover has the same stripes as the front. There are 4" twill tape ties on each corner to connect to comforter. Single fabric with turned edge seam. 92"L x 92"W. 100% cotton. Machine wash gentle. Tumble dry low. This item is imported. Please note, colors may appear differently in different resolutions and on different computers. Manufacturer's UPC code is 840528158100. The Coastal Two-Tone Stripe King Duvet Cover features stripes in a medium stonewashed denim blue and a lighter sky blue interspersed with a crème/white. The lovely blues will have you dreaming of blue skies and sunny days. For a touch of coastal charm, 12 coconut button closures on the lower end hold in your comforter. The back of the duvet cover has the same stripes as the front. There are 4" twill tape ties on each corner to connect to comforter. Single fabric with turned edge seam. 92"L x 108"W. 100% cotton. Machine wash gentle. Tumble dry low. This item is imported. Please note, colors may appear differently in different resolutions and on different computers. Manufacturer's UPC code is 840528158094.